Remember opening your present and seeing your doll for the first time? If you’re like us, this is an unforgettable moment, a treasured memory that you want to relive later with your own children. Corolle dolls will help you do this. 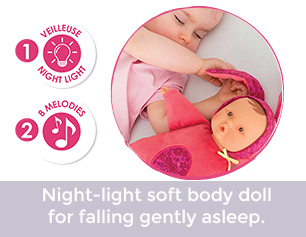 Their pretty faces and delicate vanilla scent are unmistakable—these dolls are deliciously beautiful and well-dressed. What’s their secret? Their story begins in Langeais, in the heart of France’s Loire Valley. There, a team of five people work in a stylish office just like you would see at a top fashion house where they dream up, design and select models, fabrics and materials. Each year, these passionate designers bring a sparkle to the eyes of little ones and grown-ups with their modern collections. The story continues in Asia where the dolls, clothing and accessories are made according to European and American standards. 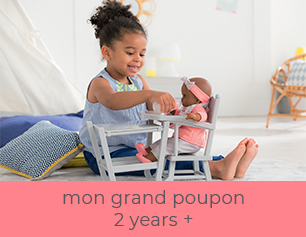 Every year since 1979, the good fairies at Corolle have called on a wealth of imagination to create dolls, clothing and accessories that fit each child’s age and stage. This play helps them learn about the world around them, imitate what they see, explore their dreams, and let their imaginations run free. 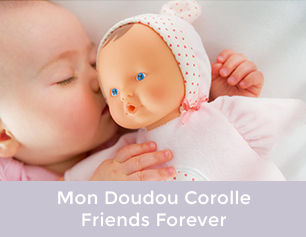 You’ll find the magic of Corolle in so many laughter-filled moments: thousands of play sessions; dolls dressed and undressed; babies fed, rocked and changed; cuddly dolls pampered and chewed on!